I love that SoulPath Art is fluid. SoulPath drawings will change as you work on yourself. I was told very early on that I DO NOT draw "Soul Portraits," which are fixed representations. You have the power (and your Inner Self has the desire) to grow. 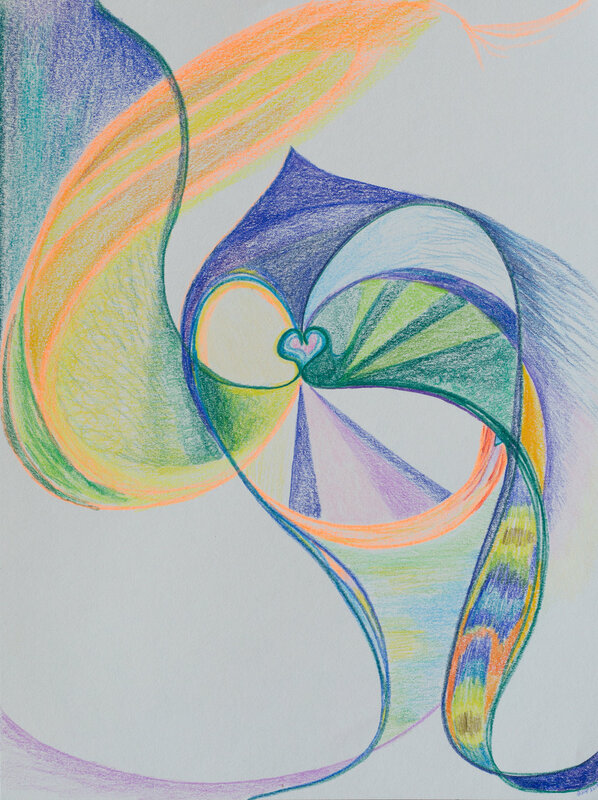 As you work aligned with your Soul Path, your Inner Self grows, your energetic vibration changes, and I tap into your shifted energy when I draw. To show you how this process goes, I'll use myself as an example. I'll give you a quick summary of the interpretation from my guides. My life path is about working intimately with others, and guiding them to grow (all the different shapes and intersections). I have had lots of assistance and a direct connection from the other side-all the bright yellow. (At that point in time, I didn't understand how present they were with me). And that I was starting to move upwards on my path (the orange triangles), and could continue this upward movement through the future if I stayed on my current trajectory. (The triangles move off into the distance). The area they wanted me to work was the bottom right. The slug-like shape showing a density and stagnant/stuck energy around my first chakra. (Note: the meanings of colors are not universal. Colors represent different things for different people). I needed to address my issues of (in)security and make changes in my familial role. After 5 months of working very hard on my 1st chakra issues, we see progress. There are still similar intersecting shapes with upward sweeps but much less density. The symbols in the drawing are more universal and easier to relate to, because the Inner Self (which is part of the bigger Source) is taking charge. Interpretation: I was to focus more on opening and expanding my heart. My default is to follow my head. I was being shown my heart is open, but to a limited extent. The heart is very small, and the green bridge only goes so far. I was being shown that there is far more energy and possibility in that area of my body/Self. And that if I open up and work on it, a powerful energy will be available. The cobra to me signals regeneration....my heart had been worn down by too much head-talk and too much relationship disappointment. When the cobra (the Kundalini) can rise through an expanded heart, the divine energy (orange and gold) becomes closer and more intimate. A few months after that, I started seeing a lot of gold energy in my meditations. If you're curious about your SoulPath, please commission one! They are beautiful personalized tools that can complement any healing modality. Please sign up with your email to receive more! I post once a month.